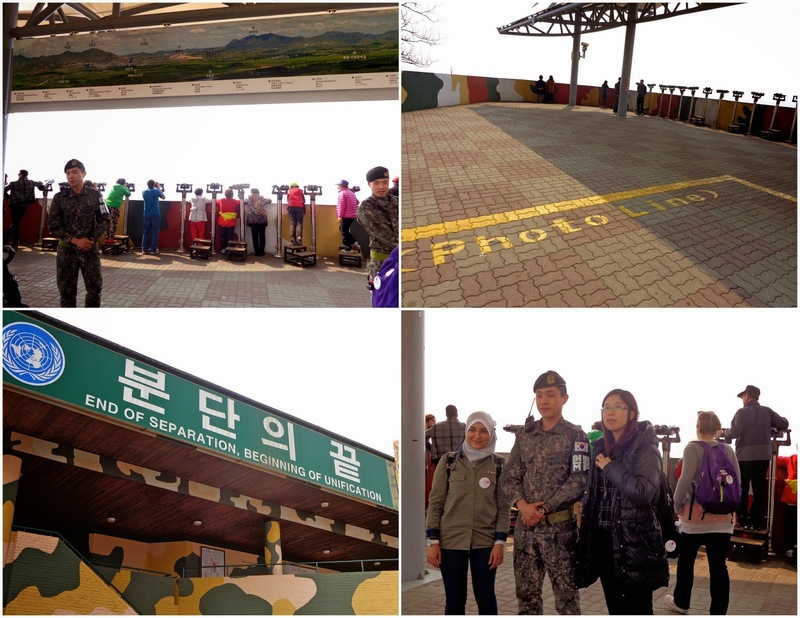 On Sunday I took a trip to various sites around the DMZ with the tour company Adventure Korea. 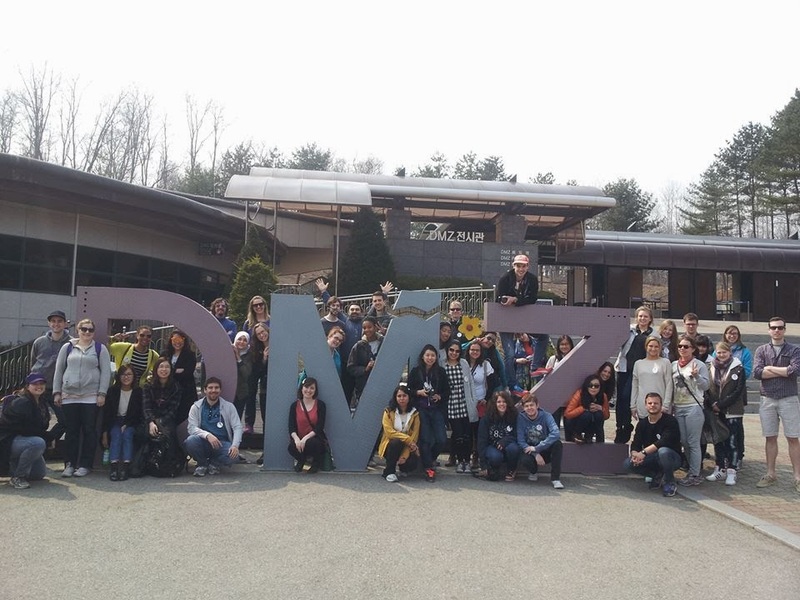 The DMZ is the Demilitarized Zone between North and South Korea, roughly along the 38th parallel north. 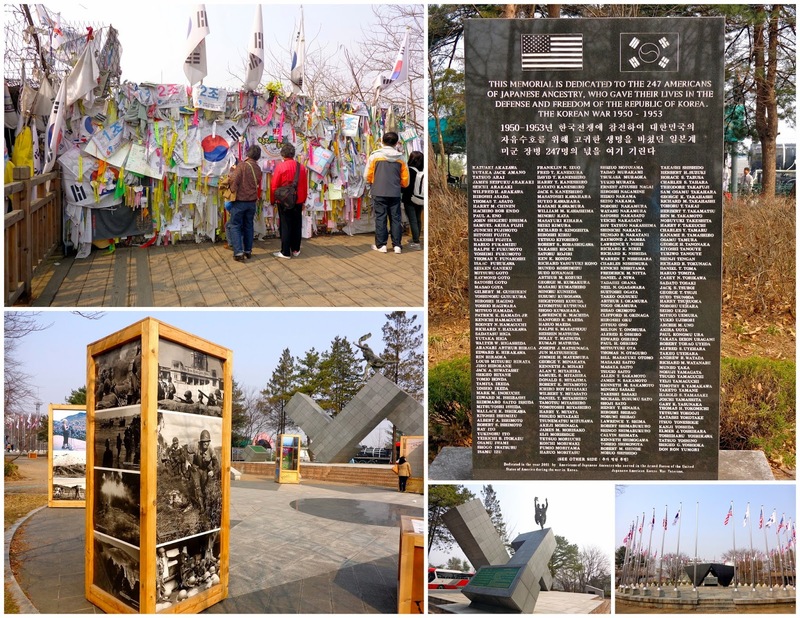 About 4km wide, it was created in 1953 as part of the Korean Armistice Agreement after over 3 million lives were lost in the Korean War. It was a few years prior - at the end of World War II when Korea was liberated from Japan - that the division was made. U.S. troops remained in the southern half of the country, while Soviet troops occupied the north. Eventually two separate governments were formed, and since then two very distinct countries have evolved. The unthinkable path of North Korea during the past 60 years is both fascinating and atrocious. I recommend the book Nothing to Envy: Ordinary Lives in North Korea to learn a little more about the country. Our first stop of the day was Imjingak, which was built in 1972 with the hope of unification. Imjingak lies 7km from the Military Demarcation Line (MDM). 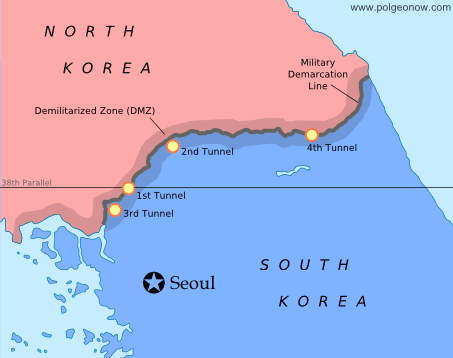 (The MDM is the imaginary line dividing North and South Korea, whereas the DMZ is the uninhabited 2km zone on each side of the MDM - 4km wide total - whose borders are clearly marked). While there were many memorials, the Freedom Bridge, and a Peace Bell in the area, there were also carnival rides right beside, which clashed together into a strange atmosphere. 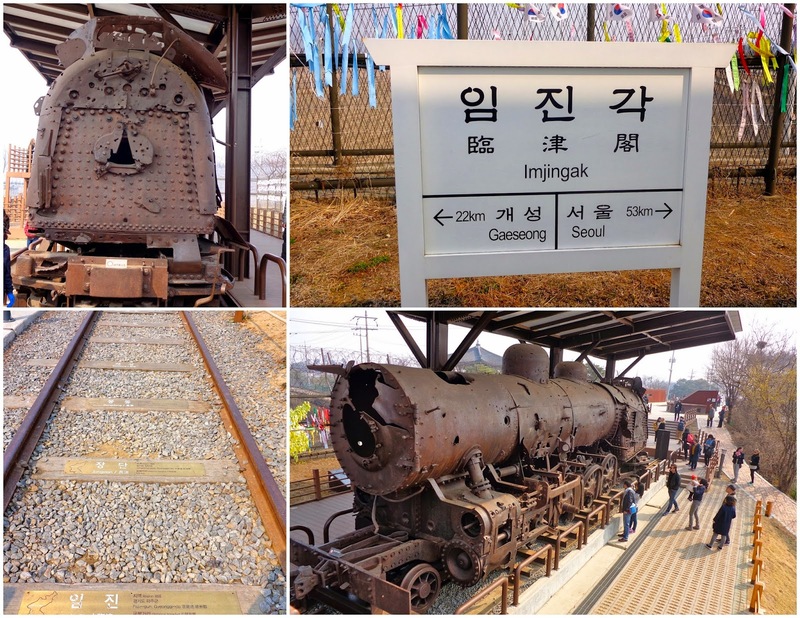 Imjingak also displayed the Geongui Train Line that had been destroyed in 1950. Imjingak is the closest village to the DMZ that you can be in freely (without governmental permission). So actually before we got off the bus our tour guide collected everyone's passport or Alien Residency Card. While we were walking around Imjingak, he used our IDs to get clearance for the rest of the stops that day. We got back on the bus at 11:15, and then had lunch at 11:30 in a nearby village. I learned that residents of these few villages that lie so close to the DMZ are exempt from taxes and military duty. After lunch we were off to see the third infiltration tunnel. Since 1974, four tunnels have been discovered in South Korea that were dug from North Korea underneath the DMZ, though experts think there may be as many as 17 tunnels. North Korea has claimed that these four discovered tunnels were old coal mining tunnels, but they were dug through granite and no coal has been found inside. The third tunnel was discovered in 1978, and that's the tunnel we got to see yesterday afternoon. The tunnel is 1,600 meters long and lies 73 meters below ground. We had to remove any bags/cameras/phones and put them into lockers before grabbing a yellow hard hat and walking down. It was a long, steady decline before we reached the necessary depth. It was a completely surreal moment for me, to know where I was standing. And while I was having all of these thoughts and soaking in the moment, people around me (yup, Americans) were jokingly singing "Hi ho, hi ho, it's off to work we go" because of the hard hats, and complaining that "This would have made such a good picture." (but cameras weren't allowed). That was the other strange part of the day that I've failed to mention: Although these landmarks were memorials of the now-divided country's painful history, people in my tour group were taking pictures and goofing off with friends as if they were at the Eiffel Tower. Many of their behaviors didn't feel right in my book. I was glad to have come alone, as perhaps I would have been more distracted and not as respectful had I come with a group of friends. 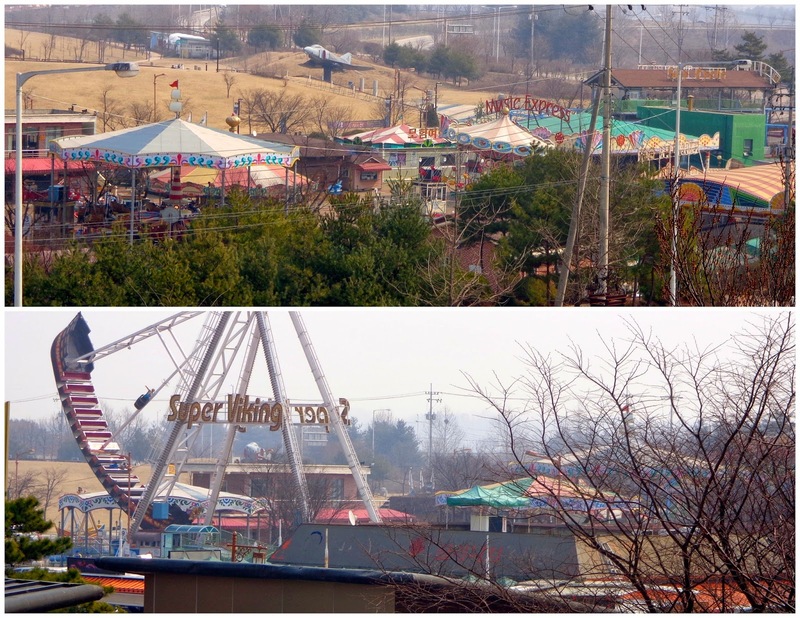 Though on the other hand, like I've mentioned, many of these place have a touristy feel, so it's a bit harder to know how one should act when surrounded by the carnival rides at Imjingak or the big DMZ letters near the third tunnel, for example. Walking back up from the tunnel was my workout for the day; it felt really good in the legs. Our next stop was the nearby Dora Observatory, where you can see across the DMZ to North Korea. Unfortunately it was quite foggy when we were there, though the fortunate part is that we were the only ones there. Thus, a South Korean soldier gave our group a presentation. Our tour guide later said this has never happened before, since there are always tons of other tourists when he's taken trips on Saturdays. Afterwards we could go outside and pay < 50 cents (500 won) to look through the binoculars. Despite the fog, I saw the North Korean flagpole that stands 160 meters tall, which was the highest flagpole in the world when it was built in the 1980s (It's now the third highest). I could also see the South Korean flag on the other side, which is not as ridiculously tall. There were a few other landmarks the soldier had pointed out that I could see through the binoculars. I had another "Is this really happening?" moment while looking at a North Korean village, mountains, and their flag directly with my own two eyes. Photos were not allowed at the look out point, which made the views even more memorable. An interesting tid bit I learned today was that the four-kilometer-wide DMZ has become a place where wildlife flourishes, which makes sense because there are no humans within its borders, I had simply never thought about it before. 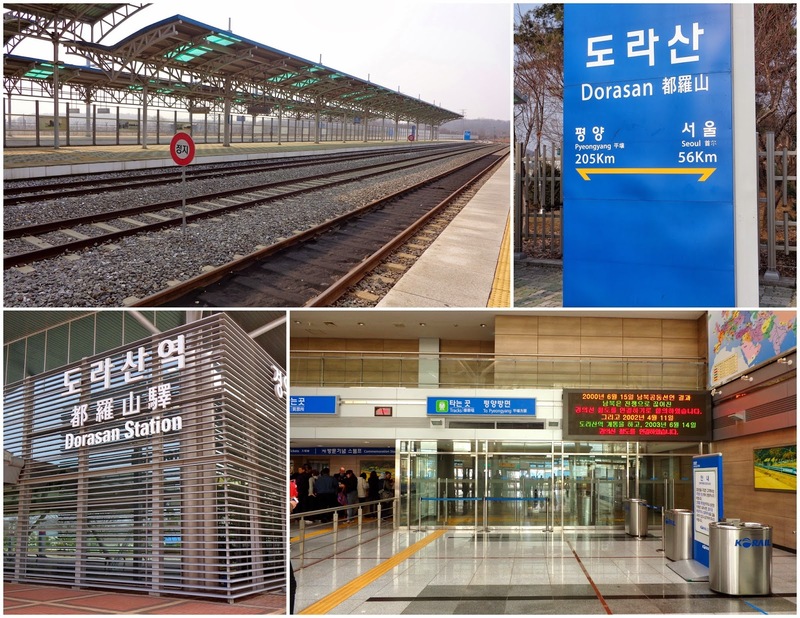 Our final stop of the day was Dorasan Station, which connects to North Korean stations, but cannot be used to cross the border. In December of 2007 trains began leaving from Dorasan Station into North Korea with materials for the Kaesong Industrial Region, the only place where both North and South Koreans work. A year later North Korea closed the border crossing, and since then materials and finished products are brought in and out of the industrial complex via trucks instead of the train. The station is currently in mint condition, ready for reunification. Its motto is "Not the last station from the South, but the first station toward the North". It was crazy to see a perfectly good train station exactly like the other KoRail stations in Gyeonggi-do, but empty. There was even a section for X-ray inspection and plant & animal quarantine. 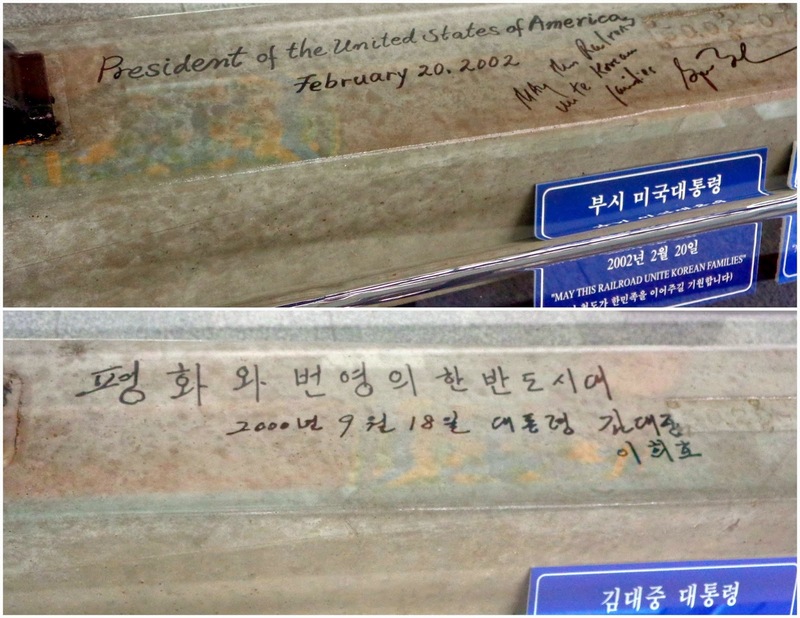 On display inside the station was a message and signature from both U.S. former President George W. Bush and South Korean former President Kim Dae Jung dated 2002. And with that, we boarded the bus one final time for our ride back to Seoul. I've been told that no dictatorship survives the third generation of ruling, and I sincerely hope Korea unifies sooner rather than later. It's so bizarre to have a group of people of the same history, language, and race be separated. Families have been separated since the split. Actually, back at our very first stop in Imjingak there were maps of the Berlin Wall near some of the DMZ maps, and I liked the optimistic idea of putting the two side by side. The Berlin Wall came down, and the DMZ can too.